Porsche notched up its 17th Le Mans last weekend thanks to a one-two finish with the N°19 (Hülkenberg/Bamber/Tandy) and N°17 (Bernhard/Hartley/Webber) Porsche 919 Hybrids, while at the same time its tyre partner Michelin gained its 24th Len Mans victory. Aided by Michelin's competitive, consistent tyres which are a perfect match for the configuration of the 919 Hybrid, Porsche also established a new track lap record with Neel Jani's time of 3m16.887s (249kph) for the 13.629km circuit during qualifying on Wednesday 10th June. Michelin's partners Audi Sport Team Joest, Porsche Team and Toyota Racing all performed quadruple stints on the same tyres in the course of the 2015 Le Mans 24 Hours, covering distances of up to 736 kilometres on a single set. Additionally, the reliability of the N°64 factory Corvette C7 saw Gavin/Milner/Taylor secure the LM GTE Pro class win at Le Mans, also on Michelins. 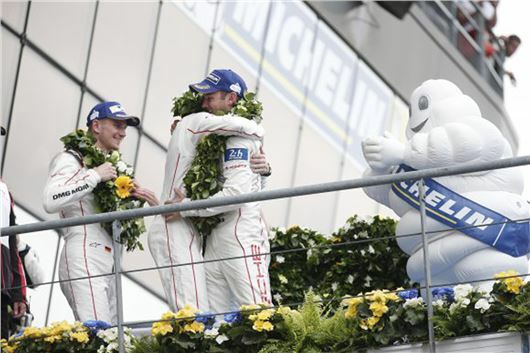 The victory in the French race of the American brand, which is an exclusive partner of Michelin both in racing and for the supply of original equipment tyres for its road cars, means it has now won the 2015 calendar's 'big three' endurance races, after earlier successes at the 24 Hours of Daytona and the 12 Hours of Sebring.